Laguiole Exception knife, Pilfrim Saint-Jacques Shell Bronze full handle 12CM, BRONZE handle, PHILIPPE VOISSIÈRE for his part thought that laguiole Pilgrim, carved in honor of pilgrims to Compostela and Conques. 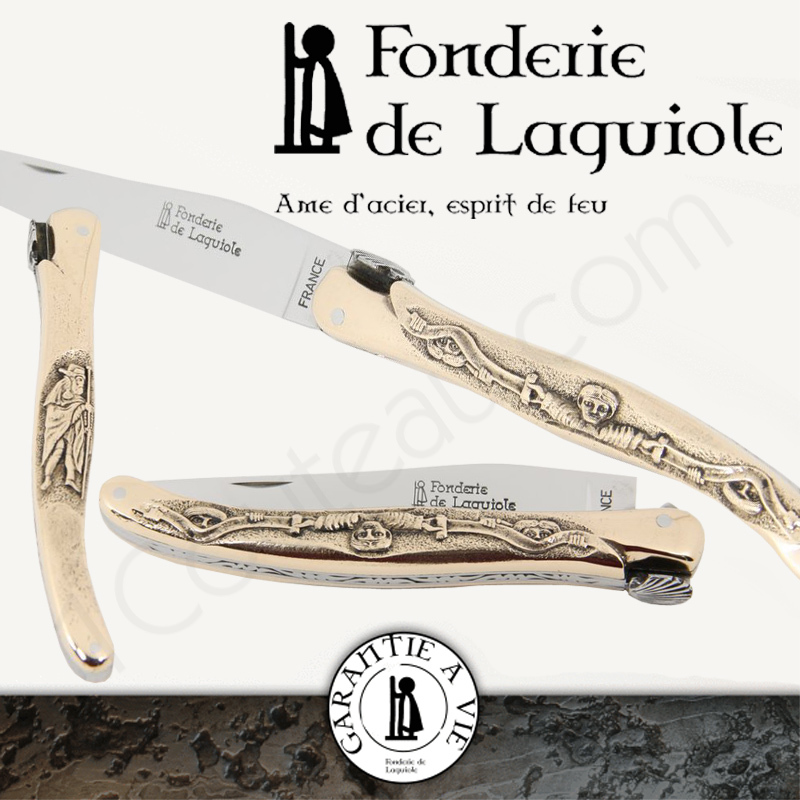 This knife is, delivered in its box with a certificate lifetime warranty by the manufacture Fonderie de Laguiole. Laguiole Exception knife 12 cm 1 piece full handle Shell St Jacques, Juniper, by the manufacture Fonderie de Laguiole. -blade: 12c27 stainless steel, 3 mm thick at the heel, hardness: 56Hrc. Polishing and finishing of the blade by hand. The punch Foundry Laguiole affixed to the blade of this knife gives you a lifetime warranty. -Presentation: Lifetime warranty certificate, with box an authentic wax seal. The story of the pilgrimage to Santiago de Compostele began in 820 with the discovery of Saint James the Greater at Iria Flavia in Galicia. King Alphonso II ordered to raise a little sanctuary over the grave in order to honour the Saint. The way to Compostele is divided into five different routes. -The Turonensis Way was taken by the pilgrims from the North and North-East of Europe. It left Paris, connected with Tours, Chatellerault, Vendôme or Orléans, Poitiers, Angoulème, Bordeaux and Dax. Then it joined the Lemovicensis Way at Sauveterre. -At the heart of Burgundy the Lernovicensis Way left Vézelay. It connected with Bourges, Issoudun, Nevers, la Souterraine, St léonard-de-Noblat, Périgueux, Bergerac, la Réole and Mont-de-Marsan. Then it joined the Turonensis Way at Sauveterre. -The Podiensis Way was created by Godescalc, the bishop of le Puy, for the pilgrims from the East of Europe. It left le Puy-en-Velay, connected with Saugues, Espalion, Conques, Moissac, Figeac or Rocamadour, Cahors, Condom, Aire, Navarrenx and finally reached Gibraltar at the junction of the Turonensis and Lemovicensis Ways. -The Tolosana Way left Arles and was taken by the pilgrims from Italy and Provence. It connected with Saint Gilles, Montpellier, Toulouse, Castres or Pezenas, Béziers, Carcassonne, Auch, Morlaàs, Orthez and Col de Somport. Then at the gates of Puente la Reina, it joined the other three roads which had met at St Palais. -The Camino Francès was built under Sancho III in order to connect Puente la Reina with Santiago de Compostele. It went through Logrono Navarrete, Burgos, Léon, Villa Franca, Samos, Castaneda and Santiago de Compostele.